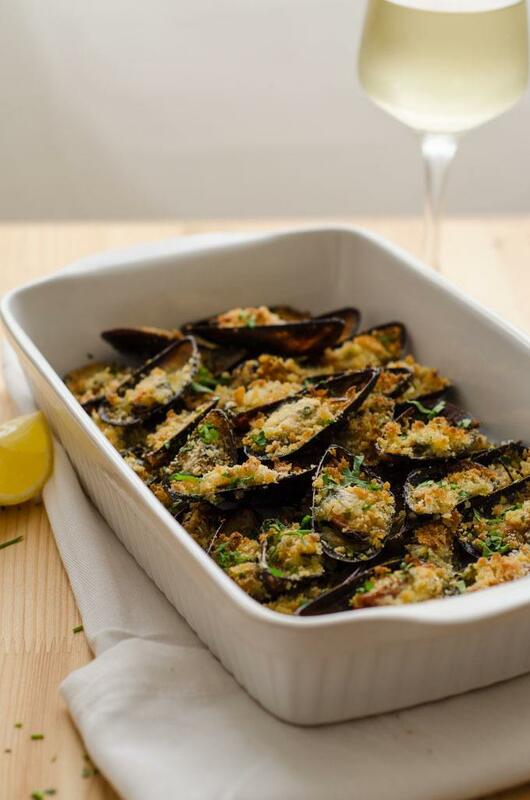 Sweet, garlicky mussels topped with crisp breadcrumbs – if you reckon you don’t like mussels or have never tried them before then this classic recipe is sure to convert you. Given the name of this blog I figured its about time I featured some of the ingredients the blog is named after. And theres no better place to start then with this recipe… a classic and a crowd pleaser. Mussels have always been a poor mans meal. Free food scavenged from the shallow, coastal water where they grow. I can still remember as a kid in short trousers picking them off rocks a long Galway bay. Looking in rock pools and under seaweed was always much more fun than eating them. Nothing much has changed, mussels are still the most inexpensive seafood around. A kilo costs 4 euro at my fishmonger but you could definitely pick them up for less at one of the big supermarkets. We farm loads of them here in Ireland, along the north atlantic coast, and there was 1.8 million tonnes consumed worldwide last year. 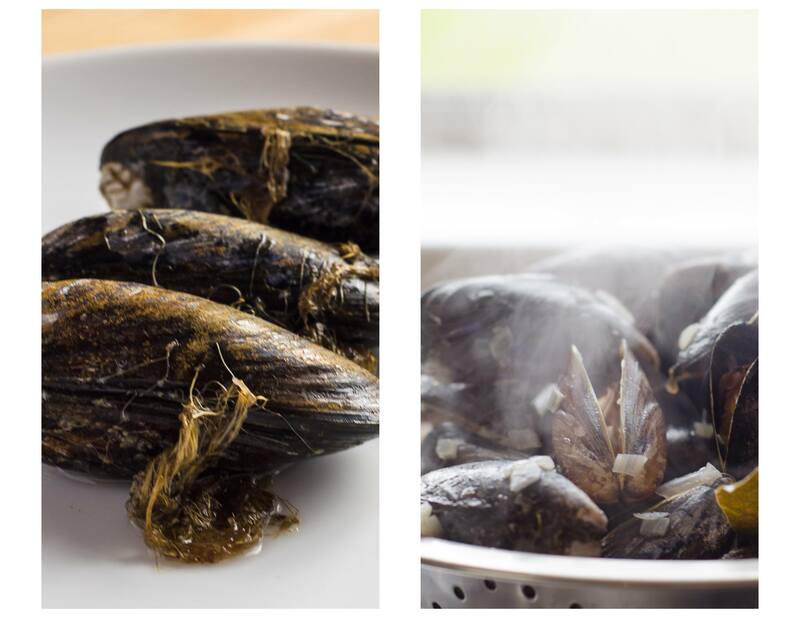 We’ve been eating mussels for thousands of years and legend has it that mussel farming was invented by Irish sailor Patrick Waltonun in 1235. When he was shipwrecked in a remote area of the french atlantic coast he tried to survive by catching sea birds. He put some nets on top of long poles and placed them in the shallow water. He soon realised he was catching more mussels on the end of his poles then birds in his nets, and so mussel farming was born. So its thanks to paddy that we have this cheap, sustainable, and tasty seafood available in abundance. Cooking mussels takes just seconds, its the preparation thats the time consuming part. You’ve got to get rid of all that sand and grit. Which involves a bit of scrubbing and rinsing in cold water. Don’t remove the beard (thats the hairy bit sticking out of the mussel, pictured below left) until you’re about to cook them. Its connected to the meat inside and pulling it out can damage that sweet, orange flesh. Cook the mussels in the broadest pan that you’ve got, and in one layer. You’ll be able to pick out the early openers and stop them over cooking. To save yourself some time make sure your garlic butter is at room temperature, then you can just use a disposable piping bag to fill the mussel shells. If you don’t have a piping bag use a freezer bag with a little hole cut out of the corner…this makes the most tedious part of the recipe 10 times faster….. If you’re having people over you could put the breadcrumbs on top and pop them in the fridge at this point. Then its just a matter of slipping them under a hot grill for a couple of minutes…its a great do ahead dinner party dishes. When you get back from the fishmongers put your mussels straight into some cold water. Give them a good scrub and remove any seaweed and barnacles. Discard any that are open, you don’t want to eat them because their already dead. Wash the mussels in several changes of cold water to get rid of all the dirt and sand. Check for any where one half of the shell rubs against the other and discard them too. They will make the others gritty when you cook the mussels. Cook the shallot on a low heat, without colour for 3/4 minutes. Add the mussels, bay leaf and give the pot a good stir. Then you pour in the white wine, turn the heat up full and give the pot a good shake. Place a lid on the pot and cook the mussels for about 3 minutes or on till they all open. Drain off the mussels, but keep the cooking liquor. Its full of flavour and you can freeze it and use it in a sauce later. Next you have to make the garlic butter. 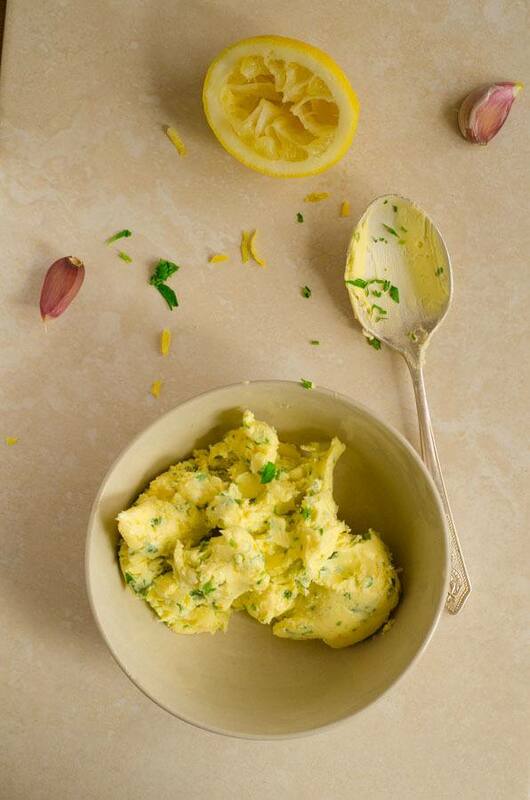 Simply combine the garlic, lemon zest /juice, parsley and butter together. When the mussels are cool enough to handle. Remove and discard the top shell. Line a baking tray with foil (saves on a bit of washing up later) and place the mussels inside. Spoon the butter into a disposable piping bag and pipe about a teaspoon of butter into each mussel shell. Top each mussel with a good sprinkle of breadcrumbs and cook under a moderate grill till golden. And receive recipes straight to your inbox every time we publish something new!